Capetonians have dug into their own pockets to ban cars from the suburb of Observatory’s main road for a day, by financing the open streets initiative to take place on Saturday 26. With no money forthcoming from the City, Open Streets Cape Town, which hosted it’s first Open Streets day, also on Lower Main Road, Observatory in May, decided to try crowdfunding to raise the R40 000 needed to run the event. The concept of an open street day was initiated in Bogota, Colombia in the ‘70s, to integrate neighbouring communities and use the streets for more than just traffic flow. 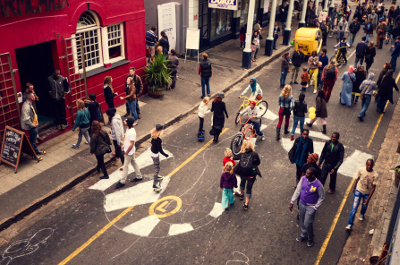 “It is an avenue to bring different communities together and to radically transform how we use, perceive and experience streets,” said Open Streets Cape Town co-founder Marcela Guerrero Casas. Together with the Observatory Improvement District OBSID, Open Streets Cape Town managed to raise R41 500 in 30 days by utilizing the crowdfunding platform Thundafund. The entire event was paid for by Cape Town residents, with contributions from local businesses. However, Casas, while relieved they raised enough money to go ahead, has mixed feelings over the crowdfunding model. “Although it was a good experience, it is not a sustainable way of funding Open Streets,” said Casas. She said ideally the city needed to adopt “this type of programme”. While the City of Cape Town has stated they support the Open Streets idea, which sees the street populated by residents on foot, skateboards, rollerblades, bicycles and everything in between, no financial support has been forthcoming. The reason for not providing funding, according to mayco member for transport, Brett Herron is that it needs to be self-sustaining. But the City maintains that they funded demonstration projects that encouraged communities to arrange local Open Streets days. Despite dependence on public donations, Open Streets has had its successes. The first event increased sales for local businesses by over 15% on the day, said Casas. It also attracted many citizen-driven activities including salsa dancing and traditional children’s games such as hopscotch. For the initiative to grow, it needs more buy-in from government and business, said co-founder Lisa Kane, for instance in Bogota, Open Streets is now a weekly event.